Team Houdini reviewed this Haunted Attraction on October 19, 2018. Eerie Acres Farm is a newer “professional haunt.” Located in Butler County, it started as a yard haunt then evolved to a barn haunt and now has expanded into a full-on professional Haunted Attraction. With only two years of professional haunt experience, Eerie Acres Farm has a lot of potentials to become one of the area’s top haunts. Focusing on actors over animatronics, they provide an in-your-face experience that is scary and entertaining. 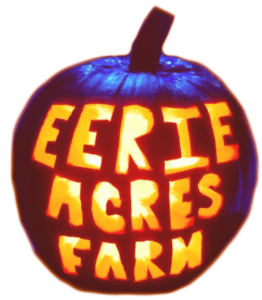 Eerie Acres Farm focuses solely on actors for scares and interaction. This places a lot of pressure on the actors to provide a good show and deliver a scary experience. Lucky for us, they did a wonderful job. We faced around forty-eight enthusiastic thespians. This is a good amount for the size of the haunt with most scenes containing at least two actors and as many as nine in one scene. There was a slight amount of downtime between scenes which gave us time to relax for a moment before entering the next area of fright. The performers did a great job of staying in character and providing an immersive experience. From “boo actors” to scripted and interactive dialogue, the deliveries were well-timed and on-target. We must say, their interactivity was some of the best we’ve encountered this season. They were also good at ad-libbing. When we entered the pirate area, we encountered two pirates with good “non-proper English” accents. One pirate said he “liked the handsome fellow in the front,” I was quite flattered. The other pirate said he wanted the frumpy one. Our team member jokingly asking, “What kind of pirates are you?” The pirate replied back, in his dirty, British accent, “Oh you know what kinda pirates we are.” The usher in the movie theater informed us the movie was just starting. I mentioned aloud the room is full of “People!” A girl popped up and continued, “It’s full of people” and said her name was Kelly and asked us to watch a movie with her. These quick and witty comebacks provided more complexity to the experience. Offering an in-the-moment connection with the customer instead of rehashing the same script. The most disgusting character was found in the bathroom area who “had taco bell for lunch”…you can use your imagination as to what that room looked like. There were some screamers, growlers, sniffers, and more individuals with great dialogue as well. Costumes were well done but we didn’t notice anything that knocked our socks off. They were realistic enough and they fit the characters and scenes appropriately. A person in the nuclear area was wearing a gas mask and hazmat suit, Dr. Wisdom wore a blood-covered apron and a mask of skin and teeth that were quite unique, the clowns had good makeup and masks, the hillbilly had appropriate overalls, the butcher had a pig face mask, and the zombies had tethered clothes and makeup that provided an undead appearance. Eerie Acres Farm was easy to find using GPS. There is a light and sign pointing towards their free parking. This haunt takes place on a farm area with uneven ground, grass, and mud. It also consists of a mixture of indoor and outdoor areas. On a rainy night, like our experience, it could be a little slippery. The staff we spoke with were very nice and helpful. The website and Facebook page provide answers to most questions. As we headed from the parking lot to the haunt, there was too much to see. A bonfire was across from the entrance to the haunt. The haunt is surrounded by huge, wooden walls hiding everything from view. There was an obvious ticket booth and a waiting line. Usually, they have food vendors on site but since the weather was rainy they closed down early. Metal music played in the line queue. There were no line actors or décor just some screams and curiosities as to what is behind the large, wooden walls. In the future, I hope that they can add some of the inside enthusiasm to the outside area. While traveling through the collection of bad dreams, the soundtracks provided a supplementary atmosphere for some scenes. Organ music played in the body bag room, the fallout room had warning sirens, banjo music was audible in the hillbilly scene, Camp Crystal Lake had dreadful music (that may or may not have been in the movie), the clown room had intense metal music blaring, and Dr. Wisdom was listening to some Frank Sinatra music, and so on. Most of the scenes are fairly common in haunts but they did provide some original takes on these excerpts. The theater scene was interesting and provided a feeling of anxiety as you wondered who was real and who was not. Dr. Wisdom the dentist had a retro feel to his dentist office. The clown room had an interesting set up that felt like a mini maze where a wrong turn would send you back to another crazy clown. The open zombie area was well done, providing a large space that quickly felt smaller as more zombies appeared. The sets had a nice amount of detail, some more than others. They provided a good engagement with the performance occurring. Perhaps a little behind other, bigger haunts, that offer more Hollywood-style designs but Eerie Acres is on the right track. (Those haunts did not start out as big and theatrical as they are now either). Since the actors do a good job I could see people being distracted from more subtle details. Everything worked cohesively. The other thing we noticed is that we didn’t view any scenes that strictly relied on eye-candy and movie-quality set design with no actors, which was much appreciated. Strobe lights, colored lighting, and fog provide additional realism to the environment. Eerie Acres didn’t follow an individual theme. They provided an assortment of scary scenes and acts. Common themes and original scenes are found within the walls of the haunt. Eerie Acres provided some of the better scares of this season. Since they focus on actors only with no animatronics the scares feel more organic. We encountered lots of jumps scares from screamers and loud sounds. The actors providing jump scares hid well and seemed to appear from nowhere. The action sequences also delivered some horrific imagery. Watching Dr. Wisdom covered in blood performing dental work on a young girl’s face was very horrendous. The crazy, creepy, clowns, chasing us around the big top was unpleasant. Walking through the theater with roughly ten bodies of unknown life was nerve-wracking. The zombie area with a growing crowd of zombies provided a claustrophobic feeling. The maze at the end, (a personal favorite that has been rapidly disappearing from haunts) had some intimidating situations. Actors led us in the wrong direction bringing us to more characters waiting to attack. The tormentors did a great job of targeting the whole group darting in and out of the areas waiting for the perfect time to pounce on their victims. Even without animatronics to grab your attention, the actors had great timing to produce excellent shocks. Encompassed with the dialogue and adlibbing, the scares were varied. The finale was a mix of the maze and chainsaw limbo and we’ll just leave it at that. The inside entertainment was excellent, providing good scares, terrifying acts, and hilarious banter. Unfortunately, the inside action did not carry to the outside. Perhaps it was because of the rain and weather but we would like to see some outdoor scares and entertainment. Standard admission is $15. We clocked our haunt time at 17 minutes, which could be dependent on how long it takes to get through the maze. That puts Eerie Acres at 1.13 minutes per dollar which is a little under the average. Eerie Acres offers a great cast, adequate scenes, effective scares and a lot of fun. The space they have set up is used well, we did not feel like there are many used well. Upon speaking with the owner and the ops manager, we learned that they have a lot of plans for expansion. Considering this is their second year and the quality is this high already, we are looking forward to what they will create for next year.